The Revolab 10-FLX2-101-USB-VOIP is designed specifically for mid- to small-sized conference rooms, executive offices and SoHo environments. 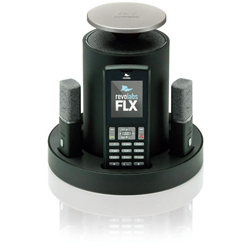 The Revolabs FLX Wireless Conference System delivers a host of professional features that include wireless transmission over the 1.9GHz ISM bandwidth, and remote placement of the base station and microphones. The 10-FLX2-101-USB-VOIP is also well suited for use with video conferencing systems. Moreover, the handset / dialer resembles a cell phone, and much like one, is capable of receiving and making calls in between and during conferences while the microphone USB easily connects to your computer.